Canada’s court system is out of control! It is completely dysfunctional. No one is accountable as judges systematically violate parent’s and family’s rights to their own children. The Divorce Act tortures one parent while unjustly enriching the other parent. 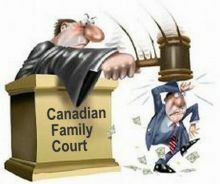 Sole custody, limited access, adversarial courts, judges and their endless discriminating court orders, lawyers, shrinks, Children’s Aid, custodial parents, no consequences for PAS and the one sided, exorbitant child support work together to deprive the other parent of all rights to their children! This is a CRIME AGAINST HUMANITY! The loss of one parent in the lives of children is the biggest social ill this country has ever seen. Where’s the media? Where are the politicians? Where are The GUARANTEED Canadian Charter of Rights and Freedoms and United Nations Universal Declaration of Human Rights? GONE! REFORM FAMILY LAW! Compensate the victims. NO EQUAL SHARED PARENTING, NOW = NO VOTES, EVER! YOU HAVE BEEN WARNED! MAKE YOUR POSTCARD AND SEND TO GOVERNMENT NOW.